ROP Emporium challenges with Radare2 and pwntools. 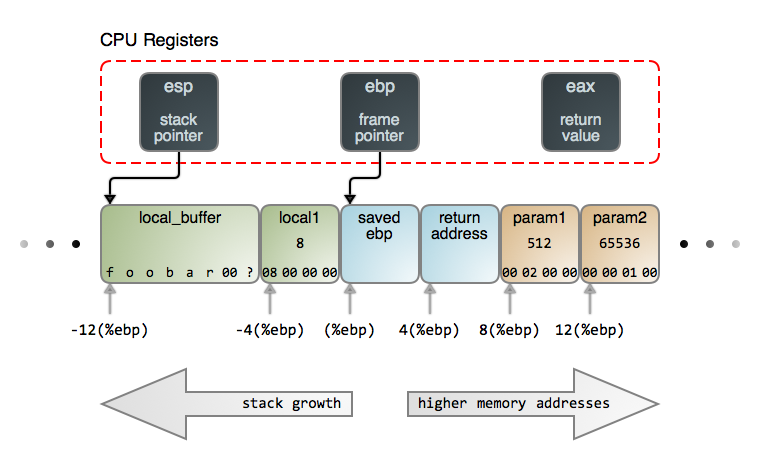 Last time in Ropping to Victory we went over the basics of Return Oriented Programming using Radare2 and pwntools. We completed the 32-bit ret2win challenge, an easy start given we already had a function that did everything for us, and we just had to call it. This time we'll be looking at the 32-bit split challenge, this one is a little more difficult as the various bits and pieces we need are split up as opposed to being perfectly set up in one function for us. We'll skip some of the more basic steps from last time, but feel free to refer back if needed. There's a lot of useful information here, but let's note in particular that pic (position-independent-code) is disabled (also known as PIE or ASLR) and we do have the no-execute bit set (nx). NX means that the stack will not be executable, which is what we expect, this is a ROP challenge so if we could just dump shellcode on the stack and execute it it would defeat the purpose of the challenge! Having PIC disabled means that our binary will not be loaded into memory at a random offset, so any memory addresses we find we can safely re-use. Note however that most modern day operating systems have PIC enabled by default so the addresses of items in linked libraries, such as system in libc will be randomised. This looks similar to last time, we have a pwnme function and a usefulFunction. Looking at the main function again we see that it just prints some stuff and calls pwnme, similar to last time. Let's take a closer look at this pwnme function. This also looks pretty similar to last time. We can see that 0x20 (32) bytes get zeroed out in a call to memset for the local_28h variable, and then this variable has 0x60 (96) bytes written to it using fgets, another buffer overflow found! Let's enter Visual Mode in Radare2 and rename this variable, in case we come back to this function later. Visual mode is a great tool in Radare2 that adds a sort of Text User Interface for analysing the code. To enter Visual Mode, we can use V, and we'll be presented with something similar to the following (albeit with colour highlighting!). 0x080484a0 |fff4 6690 6690 6690 6690 6690 6690 6690| ..f.f.f.f.f.f.f. 0x080484b0 |8b1c 24c3 6690 6690 6690 6690 6690 6690| ..$.f.f.f.f.f.f. 0x080484c0 |b84f a004 082d 4ca0 0408 83f8 0676 1ab8| .O...-L......v..
0x080484e0 |a004 08ff d083 c410 c9f3 c390 8d74 2600| .............t&. 0x08048540 |7cff ffff c605 88a0 0408 01c9 f3c3 6690| |.............f.
0x08048550 |b810 9f04 088b 1085 d275 05eb 938d 7600| .........u....v.
0x08048570 |ffd2 83c4 10c9 e975 ffff ff8d 4c24 0483| .......u....L$..
0x08048660 |c9c3 6690 6690 6690 6690 6690 6690 6690| ..f.f.f.f.f.f.f. 0x08048680 |ec0c 8b6c 2420 8db3 0cff ffff e82f fdff| ...l$ ......./.. This is Visual Mode. We have the memory addresses on the left and a hexdump on the right. We can cycle through the various Visual Mode panels using p and P, and quit at any time back to 'command mode' by hitting q. Let's cycle through the panels until we hit the Disassembly panel, which should be the next screen by default. |           0x08048490      6870860408     push sym.__libc_csu_init    ; 0x8048670 ; "UWVS\xe87\xfe\xff\xff\x81\u00c7\x19"
We now see the disassembled entry0 function, as this is the default entry point and we've not seeked to anywhere else. Let's navigate to our pwnme function, first by hitting v, then scrolling to pwnme and then hitting g to "go". We can then hit c for "cursor" mode and scrolling around the disassembled pwnme function using the arrow keys (or vim's hjkl if preferred). We've scrolled down to the first instance of our local_28h variable. We can rename this flag in Radare2 by hitting d (for "define") and then choosing the rename flag option, n.
Let's rename it to user_input and hit Enter, then hit ; to add a comment for that line and detail that it's overflowable. |           0x08048603   *  8d45d8         lea eax, dword [user_input]    ; this buffer is overflowable! Next let's take a look at the usefulFunction, and see what we have to work with for our exploit. We navigate to this function in Visual Mode, in the same way as we did for pwnme, v to list the functions, then g to go to it. We can see that we have our system call again, much like last time, however the command being executed isn't showing us our flag but just invoking /bin/ls to list the files in the current directory. Let's have a look at what strings are available to us in the binary. To do this, we use the iz command to list all strings in the data sections, or izz to list all strings in the binary. However this is a none-Visual Mode command, so to execute it from Visual Mode we hit :, then enter the command. This is a little bit easier than quitting out to command mode, then re-entering Visual Mode and finding where we were. We check just the data sections first, as this is the section where strings used by the binary are normally stored. Aha! We spot a string we can use at another location in memory. /bin/cat flag.txt is the same command as in ret2win, which should just print our flag value to the screen for us. We have the pieces we need, let's set about exploiting this thing. Let's create our pwntools script in the same way as last time, and use pwn.cyclic to determine the offset to EIP. The process crashes, as expected, and we find that the EIP overflow occurs at "laaa". $eax   : 0xffa32570  →  "aaaabaaacaaadaaaeaaafaaagaaahaaaiaaajaaakaaalaaama[...]"
$edx   : 0xffa32570  →  "aaaabaaacaaadaaaeaaafaaagaaahaaaiaaajaaakaaalaaama[...]"
$esp   : 0xffa325a0  →  "maaanaaaoaaa"
Now that we know our offset, we can start building our ROP chain. We don't have a function to call this time that will just do everything for us. Instead, we're going to have to "ret" to system directly, and set up the chain to pass the /bin/cat flag.txt string instead of /bin/ls. Now we know that we can't just invoke system in libc directly, as ASLR is enabled so its address will keep changing every time we run the executable. So what can we do? Well, the problem we're having will also be encountered by the split32 binary, it has to be able to reference system in some way if it wants to invoke it, right? The way it does this is through the magic of the Global Offset Table (GOT) and the Procedural Linkage Table (PLT). These are two sections of our split32 binary, as we can see by using objdump to list the section headers of split32. Note that the GOT is writable. The crux of how this works is that every imported function will be listed in the PLT, and the split32 code will point to that listing in the PLT. When that function is invoked, the PLT heads over to the GOT and tries to look up the actual address of the function. If it's the first time, the GOT redirects to the link loader library (ld-linux.so, which we saw earlier is imported when we used ldd) which goes and fetches the real address. The GOT will then save this value for all future calls to that function, which is why it needs to be writable. We can see therefore easily see the imported functions of a binary by examining the PLT. Radare2 did this for us automatically, and we can see them in the initial function list. All the functions starting with 'sym.imp.' are imported functions, and we can see that this includes system as we expect. The addresses here are in the address space of our binary as they are in the PLT, and so are not subject to ASLR. We can therefore just point to this address instead of the actual address of system as the binary would normally, and avoid having to deal with ASLR! We note then that the address of the system import is 0x08048430 and we have to set up the chain so that it's called with 0x0804a030 as the argument, which is the address of /bin/cat flag.txt. We're almost there. All we have to do is set up our chain so it looks like right to the processor. Inside a function, everything is stored inside a stack frame on the stack. When a new function is called, a new stack frame is set up and "pushed" on top of the stack, and when that function completes its stack frame is "popped" back off, and the first function's stack frame is still there and is restored, putting everything back in place as it had been. The anatomy of a stack frame is detailed in the below image. (Note this image was taken from Gustavo Duarte's article on the stack, a great intro and recommended reading). While all other sections in the binary start at a low-numbered address and end at an address with a higher number (like large houses on a street), the stack works in the opposite direction. This allows the stack and heap sections, which are both used to store dynamic data, to grow towards each other efficiently with no loss of space. When a function is first invoked, it executes the function preamble where it saves the value of the ebp register and creates space for the local variables. Note that as the stack grows down, subtracting numbers from ESP (the stack pointer, which points to the end or top of the stack) is allocating more memory to the stack. This means that the three values to the left to the image above are set up once we're in a function, and we don't have to worry about adding them to our ROP chain as we're setting up a call to a function before it's called. Now when when writing into memory we write from low to high addresses as we expect. Comparing this to the diagram, this means we'll be "coming in from the left" and that when we overwrite the stack with our buffer overflow after EIP we want the return address of the next function we want to invoke, then the parameters to the current function we're calling. As we don't want to invoke another function, we can just put four-bytes of rubbish and then our parameters. After our function is invoked, it will look like our stack frame was set up with a return address and parameters that are actually controlled by us! It will then enter the function preamble and push EBP to the stack and create space for the local variables. This will overwrite part of our buffer overflow buffer, but in the direction we don't care about! Here our chain is enough As to reach our offset, a 32-bit packed pointer to system in the PLT, a garbage return address of four Bs (as we don't care where it goes after we get our flag!) and then the 32-bit packed address of our cat-flag-string. [*] running in new terminal: /usr/bin/gdb -q  "./split32" 53952 -x "/tmp/pwnKLrssb.gdb"
Huzzah! We got our flag! A job well done. This was quite a lengthy post as we looked at ropemporium's second 32-bit challenge, split. We've picked up Visual Mode in radare2 in addition to a few other bits and pieces, and looked at how the binary resolves functions when ASLR is present on the host using the PLT and the GOT. Finally, we got to grips with stack frames and set up an exploit to invoke system, passing to it a string stored elsewhere in memory. Next time we'll try the third challenge, callme, where we'll have to set up our first actual ROP chain, invoking multiple functions!